One of the best moments of Kentucky’s season will be have to when senior receiver David Bouvier caught the go-ahead touchdown pass in the opening win over Central Michigan. Or maybe it will be his touchdown catch against Florida last week when the Wildcats ended that 31-year losing streak to the Gators. He came to UK as a walk-on from Lexington Catholic where he led the team in career receptions (215) and career yards (3,156). Before this season, he had played in just six games with one catch. However, he started at both receiver and punt returner in game one and did so again against Florida. Bouvier said he was happy for his parents when he became a starter this year. “I was a walk-on. They made sacrifices for me. It’s a good deal to repay that with a scholarship and bring them joy on Saturdays,” he said. He admitted there was a little bit of “disbelief” when he saw his family after the first game. 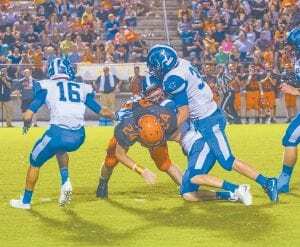 “I think we were all still kind of shocked that I started and then also had a touchdown catch,” Bouvier said. “We knew we had come a long way. It was really cool and a special moment with all of them after the game. His mother, Jeanne, admits as time went on, she wondered if he would get to play regularly at UK. Now he’s caught a touchdown pass in two straight games and been part of ending the streak against Florida. 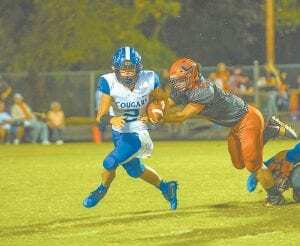 Letcher Central’s Wil Parks and Jonathan Sergent teamed up for a tackle at Union High in Virginia while teammate Wyatt Ison stood ready to assist. The Cougars are scheduled to host Pike County Central this Friday night at Ermine. His mom, a semi-retired nurse at UK, knows returning punts is not an easy task and can result in the returner taking big hits from tacklers. She says she watches and believes he can survive whatever is thrown at him. Bouvier doesn’t want his mother to worry, especially when he’s returning punts. However, he did lie to her about the hits he sometimes takes. “It is kind of a mental thing to get back up quick and not let those guy think they can hurt you. I can’t lie. I have had hits that hurt in previous years but as long as I get back up I feel fine and the adrenaline gets going again,” he said. Does his mom know that? “Don’t tell her because I’m not. If she knew it hurt, she would worry,” he said. Spending a week in the Bahamas with coach John Calipari and his Kentucky players was an enjoyable experience for SEC Network play-by-play announcer Tom Hart. But spending time with Kentucky fans was even more fun for him. “I ran into all kinds of UK fans from the CEO of a million dollar business to a Kentucky fan who had Super Bowl rings to just the average run of the mill fans, and I really appreciate those fans,” Hart said. He grew up a Missouri fan and still remembers his father taking him and his brother to a NCAA Tournament to watch Missouri play. “We didn’t have the money for anything extravagant, but I thought it was one of the coolest things ever to see my team play an away game, especially in the NCAA Tournament,” Hart said. “Maybe that’s why I enjoyed being around the Kentucky fans, and there were so many of them there. I got to meet them, take pictures with them. It was really a fun trip. Benny Snell will be chasing Sonny Collins’s rushing record at Kentucky all season. Collins rushed for 3,835 yards and 26 touchdowns before becoming a second-round draft pick of the Atlanta Falcons in the 1976 draft. He was a threetime all-SEC pick and SEC Player of the Year in 1973. He now lives in Georgia and is retired from Delta Airlines. However, what he’s not doing now is tracking how Snell is doing in pursuit of becoming UK’s all-time leading rusher. After Saturday night’s game at Florida when he ran for 175 yards, Snell has 2,724 yards with 10 more regular season games this year and hopefully a bowl game. He needs 1,112 yards — or 111 per game in the regular season — to break the record. He’s averaging 150 yards per game going into Saturday’s game against Murray. “I personally do not keep up with the UK football program,” Collins said. “UK basketball, I do keep up. I know that’s very strange but I enjoy basketball and I always have. Congratulations UK Football! So happy for team, staff, and fans. Especially moved by Game Ball for the great John Schlarman. John is one of the best players ever at UK, and one of the finest gentlemen I have ever known. God bless Coach Schlarman and all who support him right now,” former UK coach Bill Curry after UK coach Mark Stoops gave a game ball to offensive line coach John Schlarman after UK beat Florida.